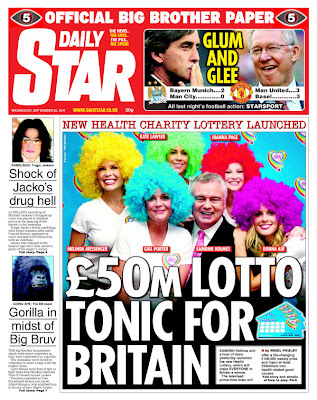 Of course, it was to be expected that these papers would give the lottery such glowing, prominent coverage. Why? 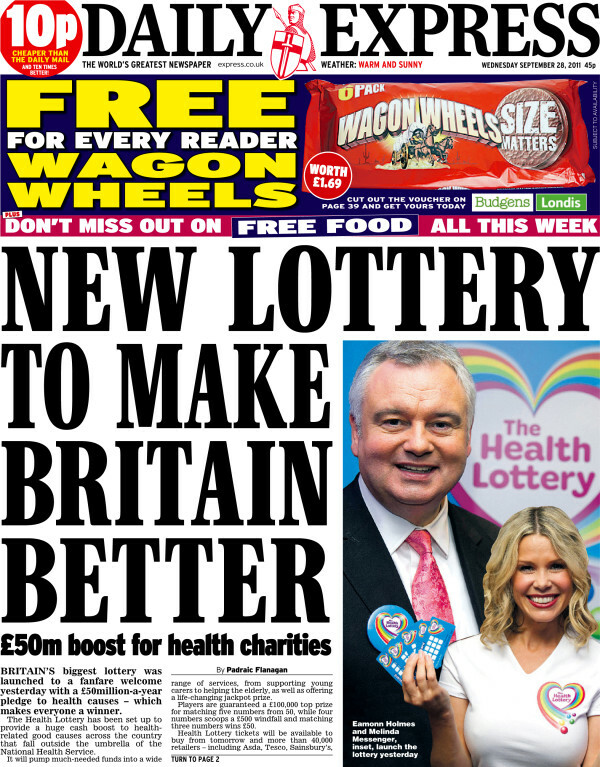 Because the Health Lottery is being run by Northern and Shell - the Richard Desmond-owned company that also owns...the Daily Express and the Daily Star. One thing the papers probably won't mention is the criticism levelled at the Health Lottery for giving 20.5p of every £1 ticket to good causes, compared with the National Lottery's 28p. Presumably they also fail to mention the criticism that the new lottery will take money away from the National Lottery (while giving back a smaller proportion of the takings). Still, at least the Express and Star will get some good promotion out of it, meaning that Richard Desmond will get richer while the 'good causes' lose out. Or am I being unduly cynical there? 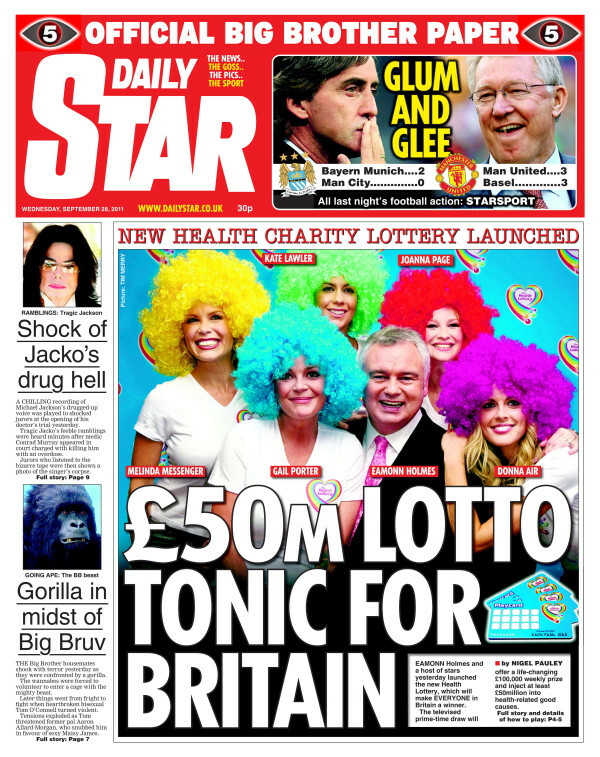 "Britain's Biggest Lottery" What with the charity furor and an alleged top prize of £100,000 compared to the National Lottery's routine prizes of millions and greater charity output, that statement would, in fact, be a blatant lie. Time to complain to the... Oh Wait... Classy, Desmond, Classy. As we all know, Desmond and the truth are strangers to each other. Remember that libel case he lost be he claimed he had won? The latest example comes from this week's "Private Eye". According to Desmond, Celebrity BB was watched by "20 million people", when in fact the viewing figures were just ten percent of that number. 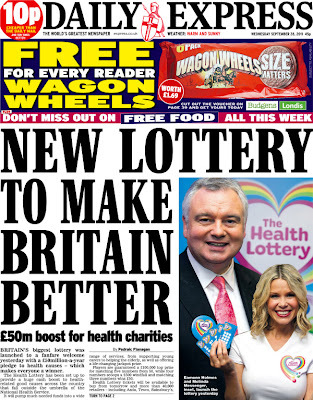 I was wondering why 'Healthcare Lottery' was suddenly a thing to praise and not a condemnation of the NHS. Press Gazette is reporting that a complaint has been lodged to the ASA regarding both of these front pages on the grounds that they are advertorials masquerading as genuine news stories. I hope the complaint is approved.